Buyers Products introduced the SaltDogg PRO Series electric spreaders, designed to spread bulk salt or salt/sand mixes. 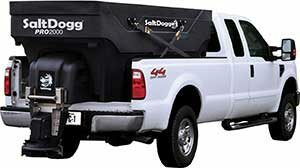 SaltDogg PRO2000 models, which are 2 cubic yards, can fit in a full-size pickup truck. The SaltDogg PRO2500 models, which are 2.5 cubic yards, are designed for use with a flatbed, dump truck or large pickup truck with dual rear wheels. The models come with either a full-length auger or a 12-inch pintle chain. A high-flow chute, designed to swing away for bulk unloading, and a 14-inch spinner give the spreaders the velocity to maintain consistent coverage at high speeds. The spreaders also feature Buyers’ double-wall poly hopper, and each PRO model includes a top screen, stainless steel inverted V’s and a fitted tarp for material protection. In addition to the SaltDogg series launch, the company also launched a new website. The new site features the entire Buyers product assortment, including the SnowDogg, SaltDogg, ScoopDogg and DumperDogg brands, and features detailed product pages with media including photographs, videos and 360-degree panoramas. Users can browse more than 16 categories of work truck, towing and snow and ice management equipment. The new “Where to Buy” function allows users to find a dealer nearby who specializes in the type of products they are browsing. It also features “Business Partner Access,” a password-restricted area where existing Buyers Products customers can log in to check prices and availability and make purchases.